To an unprecedented degree, a technological society requires visual literacy skills as well as verbal. This combination of visual and verbal skills, or the ability to produce image as well as text, is "the new literacy." Children's natural drawing skills and their tendency toward a broad range of communicative marks is often marginalized or misunderstood. Technology's requirements for this new literacy forces us to take another look at spontaneous mark-making behavior - scribbling and drawing - in children, and to respect it and encourage mark-making as the place where this new literacy - in all its range and variety - begins. Dr. Sheridan's books meet this demand for multiple literacy skills by encouraging the natural capabilities of our brains, starting with the universal skill that everyone can do, drawing. The abilities to write and to read depend upon core skills including the ability to pay attention, to extract information, to communicate ideas and emotions clearly, and to use both words and images. In short, to use the whole brain. These skills can be learned through training in drawing. Drawing is a universal skill. Everyone can draw. No one teaches us how. 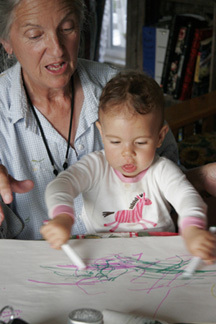 Drawing is a language instinct.When talking and writing accompany drawing, verbal skills grow and a double literacy develops, both visual and verbal. This “new literacy " is as old as paleolithic cave drawings and as new as computer technology. The New Literacy rests on a new theory of multiple literacies. Humans as language-users have one unique characteristic: they make marks of meaning. These marks first take the form of scribbles. Then, children draw. The marks are equipotential: they can become anything: drawing, writing, mathematics, musical notation. The number of systems for meaning-making each of us learns depends upon opportunity, encouragement and instruction. It depends on our parents, our teachers, our environment, and our culture. Ultimately, it depends upon our brains and how we choose to use them. Neurologically speaking, literacy is visual/verbal; it is both. The corpus callosum connecting the right and left hemispheres of the brain insures that thinking is a complex, cooperative unity- no matter what kind of thinking is going on. In this sense, the New Literacy models integrated brain function. The more mark-making systems we use, the more powerfully we think. Multiple literacy is our goal and our birthright. Drawing/Writing and the new literacy: where verbal meets visual is a textbook/handbook for teachers and for schools of education. It is also a parents’ guide to a home literacy program. The book provides classroom support for teachers across grade and discipline who are interested in a broader approach to literacy, or who have already been trained in Drawing/Writing through workshops or through school of education courses or via self-instruction. the book provides the same kind of support for parents. The 500-page book is illustrated with student work across grade and field grades K-12, as well as at the college level, and at the Elderhostel level. Drawing/Writing can be taught by reading aloud, and the How-To section of the book is written in a script-like form. The book is divided into four parts. The first part provides the rationale for a new theory of education called neuroconstructivism * (Sheridan, 1990) and a new literacy strategy across content areas called Drawing/Writing. The rationale is from a combination of sources: art history, psychology, children’s drawings, the history of writing, and, most compellingly, neurobiology. The second part of the book lays out the five-step Drawing/Writing program step by step while providing supplementary information, especially in connection with geometry, or the study of shapes in space. An ethics component is included in connection with abstract drawing using two new concepts: Acceptable Differences and Right Relationships. The third part of the book -“Hitchhikers’ Guide to Brain Science” - offers information on brain structure and function, including 13 tips for teachers and parents and students on how to encourage and enhance brain development. This section includes a heightened-experience approach to school-based drug education programs. The last part of the book outlines a generally applicable cross-modal approach to curricula called “The Thinking Child.” This section includes detailed, illustrated cross-modal English and Fine Arts curricula appropriate K-12 as well as at the college level. For more information on the book or courses and presentations on Drawing/Writing, or if you have further questions or requests, contact the author/instructor/consultant directly via methods listed here.